Victory is sweet - A UEFA cup soccer game between Maccabi Petah Tikva and Macedonian team Baskimi ended in anti-Semitic chants of “heil Hitler” by Macedonian fans, after the Israeli team won an overwhelming victory of 5-0 over their Macedonian hosts. Petah Tikva, second in the national league, reacted with much anger to comments by the Macedonian coach, who said before the game that his team would humiliate the Israeli team and predicted a 3-0 outcome in his favor. But the remarks, and 1,500 hostile Macedonian fans were unable to deter Petah Tikva from placing five unanswered goals in the back of the Macedonians' net, marking a promising start to a campaign to qualify for the UEFA Cup first round. 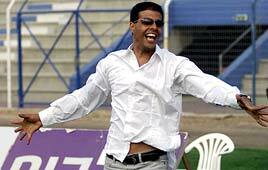 Petah Tikva’s president, Amos Lozon, said after the game that his team’s opponents “choked. We did it, and did it easily, and we opened with a powerful blitz. The team was fully prepared, and we were aware of their weak points. It's not that they’re such a weak team, we simply played an outstanding game,” said Lozon. Lozon said he did not forget the statements made by the hosts before the game. “We answered all their boastfulness and their arrogance on the pitch. Our next task is to continue, determined, and to pass through to the next stage,” he said. See all talkbacks "Nazi slurs mar soccer match"